For the launch of the Container Sales branded sale events, One Kings Lane went to India with interior design star (and one of our site's Tastemakers) Nathan Turner. For this new sub-brand, I was inspired by vintage travel, stamps, and postage. I used this as a jumping off point to first create a logo, then other secondary graphic elements that I used as a base to then create marketing placements, website, printed invitations and so on to promote the launch of the Container Sale. Hugely successful, this brand has now become a recurring sale highlighting various cities and countries with famous interior designers as our guides to the best merchandise all around the world. Below are a few snippets from highlighted campaigns I did. 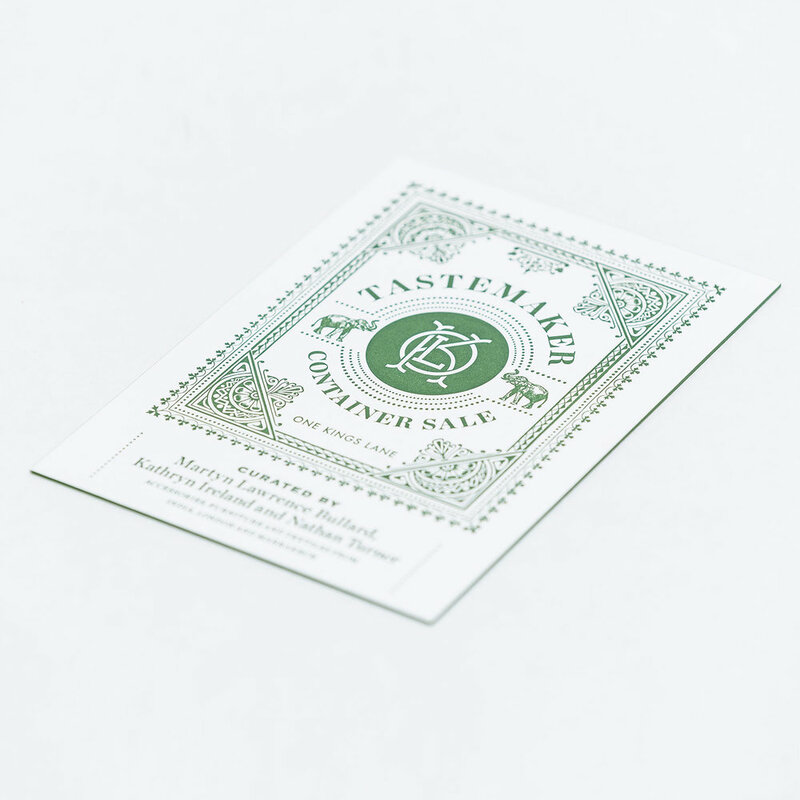 The main logo mark I created was inspired by vintage travel and stamps. I incorporated deconstructed pieces of One Kings Lane main logo (monogram, elephants) to tie the two together. All secondary graphics supported each campaign, and the "stamps" I created were also used by the stylists in photoshoots (see above) as actual stamps. Like the primary logo, all secondary graphics were based on my research of popular vintage travel motifs. Onsite promotion prior to the launch of the first ever Tastemaker Container Sale. Campaign Preview landing page, main sales page, and editorial content featured below. Established video title design identity of the launch campaign and carried on to all future campaign videos. You can watch the video right here. Onsite promotion prior to the launch of the Martyn Lawrence Bullard Tastemaker Container Sale. Onsite promotion prior to the launch of the Hillary Thomas Tastemaker Container Sale. Senior Designer. Designed and Art Directed project from concept to completion. Designed logo, secondary graphics, branding, overall aesthetic. Designed assets for both print and web. 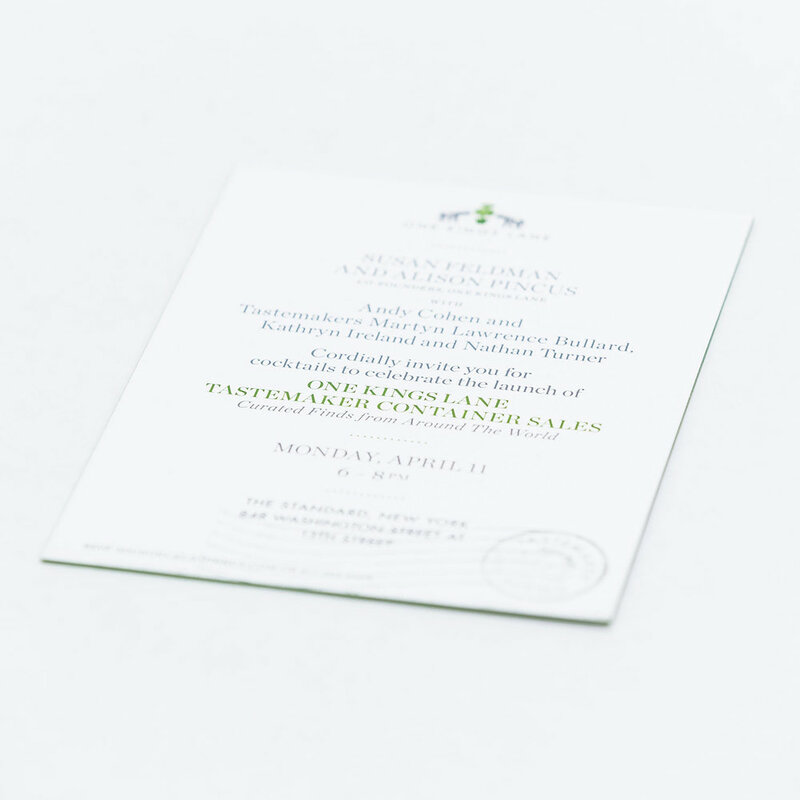 For print, I designed an invitation, Thank You card, gift card packaging, and candle label. For web, I designed banners and various marketing placements, email, landing page, graphics for social media, the product display page header, and video title design.